Fascinating facts about Modern Pentathlon - Website of andyarchibald! 1. Until the 1996 Olympics, the Modern Pentathlon had always been the first Olympic event to take place in the programme. From the advent of the One Day Event in 1996, it has changed to being the final Olympic event. 2. The two great Soviet Union competitors, Igor Novikov and Pavel Lednev each won the World Championship four times but neither ever achieved an individual Olympic gold medal. 3. The pentathlete with the most Olympic medals is Pavel Lednev of the USSR. Between 1968 and 1980 he won seven medals, one silver and three bronze medals in the individual event and two gold and a silver in the team event. 4. Only one pentathlete has competed in five Olympics. Peter Macken (AUS) took part in the 1960, 1964, 1968, 1972 and 1976 Olympics. 5. Only two pentathletes have ever won the Olympic title twice. Lars Hall (SWE) won in 1952 and 1956 and Andrei Moiseev (RUS) won in 2004 and 2008. Moiseev was in line to win an unprecedented third consecutive Olympic title in London in 2012 but finished 7th. 6. 1912 is the only occasion when competitors have been allowed to ride their own horses in the riding event. 7. Only two British pentathletes have competed in four Olympic Games each –Jim Fox (1964, 1968, 1972, 1976) and Richard Phelps (1984, 1988, 1992, 1996). 8. Only one woman has competed in every Olympic event so far (2000, 2004, 2008, 2012) -Elena Rublevska (LAT).Three others - Paulina Boenisz (POL), Tatiana Muratova (RUS)and Zsuzsa Vörös (HUN) all competed at the previous three Olympic Games. 9. 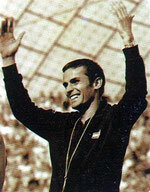 Vaho Yagorashvili competed in Modern Pentathlon at three different Olympic Games representing three different countries – USSR (1988), Georgia (1996) and USA (2004). 10. The youngest ever competitor at the Olympics was Aya Medany (EGY) who was only 15 at the time of her debut in 2004. No flash in the pan, Aya was still one of the leading pentathlon women at the 2012 Games. 11. The oldest competitor was Carl Paulsen (GER) who at 53 competed at Stockholm in 1912. However, since he dropped out after the opening shooting event, he didn’t have time to show his remarkable ‘evidence of elasticity at that age’ mentioned in the local press of the time. 12. The youngest ever gold medallist was Anatoli Starostin (URS) who, at only 20 years old, won the 1980 Moscow title. 13. Sheila Taormina (USA) was a sporting phenomenon. 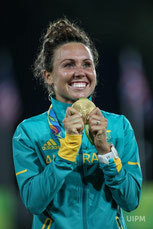 In 2008 in Beijing, she was competing in her fourth Olympics in her third sport (Modern Pentathlon). In 1996 she was a gold medallist in the swimming relay and in 2000 and 2004 she competed in Triathlon. In Beijing she won two events (swimming and riding) but won only 4 of her 35 bouts in the fencing. Her entry in the Modern Pentathlon in Beijing broke two records –as well as her multiple sports achievement, she was also, at 39, the oldest woman competitor ever in Olympic Modern Pentathlon. 14. The country with the most Olympic medals is Hungary who have won 22 medals (including 9 gold). Hungary eclipsed Sweden (who have 21) with Adam Marosi’s bronze medal in 2012. In third place is the Soviet Union with 15 medals. However, since the break-up of the Soviet empire, former members of that union have won a further 14 medals. 15. Only Great Britain has been represented at all 23 Olympic outings so far. Just behind (on 22) are France, Italy and USA. Sweden have made 21 outings. 16. In 1932 in Los Angeles, Johan Oxenstierna (SWE), the eventual winner, was arrested by the local police for practising shooting in the local woods before the shooting event. He persuaded the policeman to come to the competition range and, once there, managed to convince him that he was shooting for good reasons. 17. The most comfortable Olympic victory was by Wille Grut (SWE) in 1948. In those days, points were given for your position in each event, the lowest scorer to complete all five events being the winner. Grut amassed a total of only 16, 31 placing points ahead of the silver medallist. 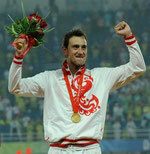 He won three of the five events outright - riding, swimming and fencing. 18. Lasse Hall (SWE) won the first of his two individual gold medals in 1952 but he had some luck: his first horse went lame and he re-drew the best horse in the competition, picking the lucky ball from six in the bag. He also turned up late for his shooting event but a team protest had sufficiently delayed proceedings for him to be able to shoot. 19. Latvia made history at London 2012. Both Denis Cerkovskis and Elena Rublevska competed in their fourth consecutive Olympic Modern Pentathlon event. 20. No startlingly old pentathletes have won the Olympic event. The oldest at 34 was Andras Balczo (HUN) who won in Munich in 1972. Wille Grut (SWE) was 33 when he won in London in 1948 and Johan Oxenstierna (SWE) was 32 when he won in Los Angeles in 1932. All the other winners have only been in their twenties. The oldest woman to win was Steph Cook (GBR) in Sydney in 2000 at the ripe old age of 28! The average age of all 23 male champions is 26.73 years and of the 4 female champions, 26.6 years. 1. Tage Bjurefelt (SWE) was the first World Champion in 1949. He won three of the five events but then, after his single victory, he never competed in a major competition again. 2. Lars Hall (SWE) who won the next two World Championships is one of a small number of men who have won both World and Olympic titles. The others are Balczó (HUN), Peciak (POL), Masala (ITA), Starostin (URS), Skrzpazek (POL) and Svatkovsky (RUS). 3. Among the women, only Steph Cook (GBR) and Zsuzsanna Vörös (HUN) have won both World and Olympic titles. 4. Winning the World Championship in Olympic year has, unfortunately, not been a good predictor of Olympic success. Zsuzsanna Vörös (HUN) is the only pentathlete to have achieved this feat. 5. World champions, Igor Novikov (URS), Bjorn Thofelt (SWE), Pavel Lednev (URS), Boris Onischenko (URS) and Janusz Peciak (POL) have something else in common: they all scored zero points in the riding event of a World Championship. 6. In 1994, the women’s teams from Poland and Italy tied for first place with exactly 15,352 points each. Positions in each event had to be calculated and that gave the victory to Italy. 7. When Anna Sulima (POL) won the individual title in 1998 she was adding to some impressive career success in the World Championship. Apart from that individual gold, she had won 8 golds, a silver and a bronze in the team event and 3 golds and a silver in the relay. 8. Sulima’s team mate, Dorota Idzi was possibly even more successful. She won the individual gold in 1988 plus a silver and 3 bronzes. In the team event she won 7 golds, a silver and a bronze and in the relay, 6 gold medals. 9. On only four occasions has the podium in the individual event been filled entirely by members of the same nation. In 1957, 1973 and 1974 the USSR’s men had a clean sweep and in 1982 Great Britain’s women achieved the same triumph. 10. China produced its first two individual World Champions, one male, one female, in Qian Zhenhua (2005) and Chen Qian (2009). Korea’s victory in the Men’s Relay in 2012 also showed that Asian pentathletes are now leading the world. 11. In 1953, Hungary and Sweden were the only European teams at the event in Chile. Hungary won comfortably but a protest from Sweden about a riding infringement had the Hungarians disqualified and Sweden named the new champions. Sweden never won the team event again. 12. Hungary has won the most gold medals in the men’s competition (13 individual, 17 team and 10 relay). Poland is the most successful women’s team (5 individual, 11 team, 8 relay, and 1 mixed relay). 13. In the short history of the Mixed Relay (2010-2012), the Ukraine team have claimed the event as their own with two golds and one silver medal. 14. Not many athletes have won both Junior and Senior World Championships. Men in that category are: Kelemen (HUN), Starostin (URS), Fabian (HUN), Svatkovsky (RUS), Balogh (HUN), Moiseev (RUS), Marosi (HUN) and Karyakin (RUS). 15. Women who have won both titles are: Suvarova (RUS), Vörös (HUN) and the only non-Hungarian /Russian in the list, Claudia Corsini (ITA). 16. Teams from North America have won the Men’s team title on three occasions: USA (1979), Mexico (1998) and USA again (2000). However, the Women’s individual title was won by Lynn Chernobrywy (CAN) in 1983 and by Lori Norwood (USA) in 1989. Bob Nieman (USA) was also World Men’s Champion in 1979. 17. Nico Motchebon (GER) who won silver and bronze relay medals at the 1989 and 1991 World Championships made a very unusual sporting transition. In 1995 he broke Sebastian Coe’s European Indoor 800m record and then finished 5th in the 1996 Olympic final in Atlanta. 18. When Pernille Svarre (DEN) became World Champion in 2000, it was the result of a long hard battle. She had competed since the very first Women’s World Championship in 1981, nineteen years before. 19. Sophie Moressee (FRA), a silver medallist in 1986, also had a long career in Modern Pentathlon. She went on to become a member of France’s gold-medal winning epée team at Atlanta in 1996. 20. In the early years of the Men’s World Championship, when numbers were low, there were, nevertheless, entries from countries such as Argentina, Chile, Belgium, Cuba, and Uruguay.